Thin-section under crossed-nicols (5 mm in diameter). Alkali-feldspar Syenite Porphry. This rock is holocrystalline, porphyritic- aphanitic with fine- to medium-grained phenocrysts in a grey-brown groundmass (25%) composed of very fine-grained fibrous mica and epidote. All crystals are subhedral except the opaque minerals (<1 mm) which are subhedral to anhedral. The following are present as phenocryst phases: acicular greenish-brown hornblende (1-5 mm) dominates the groundmass; orthoclase (<1 mm) is moderately altered to fine-grained phyllosilicates; sector zoned titanaugite (.5mm to 2 mm); apatite (<1 mm); plagioclase (< 1 mm); analcite (<1 mm); zircon (<1 mm); epidote (<1 mm). 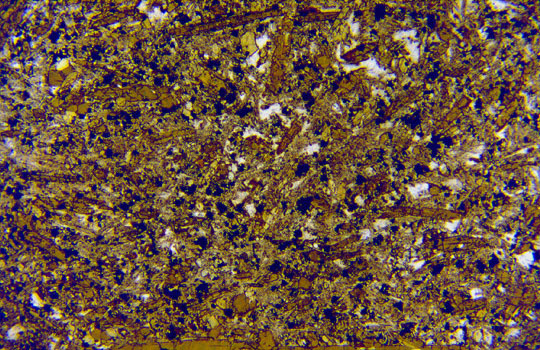 Spherulite (2.5 mm) surrounds an amygdule with a core of potassium feldspar and quartz (with undulatory extinction). The overall texture is trachytic. Hornblende was the phase dated.